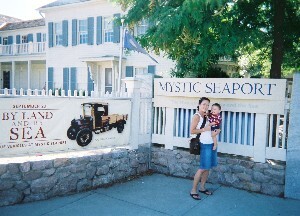 Mystic Seaport is an outdoor maritime Museum that tells the stories of America and the sea. Located on a 40 acre waterfront site in the town of Mystic, Connecticut, the museum exhibits historic tall ships and small boats, a New England coastal village and extensive collections of art, shipmodels and artifacts. The museum also offers hands-on activities for children and adults, crafts demonstrations, educational programs and a variety of special events. Mystic Seaport is also the site of current efforts to build a replica of the ship Amistad, a Spanish slave-ship commandeered by 53 Africans who were to be sold into slavery in Cuba. So I guess that’s what makes this place worthy of the Amistad Trail. Truth be told, I don’t even remember that being there when we visited. But it is a great place to visit, Amistad replica or not.